Its Official. I’m a Published Author! It’s Official. I’m a Published Author! This morning I got up and was soon checking my email. 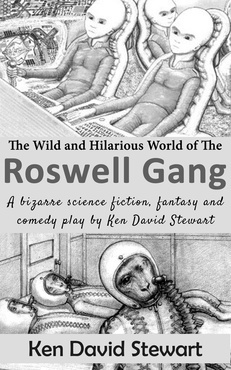 I was very happy to get a message from Kindle Direct Publishing informing me that one of my books, The Wild and Hilarious World of the Roswell Gang is now available for purchase on Amazon. I am aware that I have posted excerpts from this book on my own web sites on many occasions over the years and have received a positive response in terms of numbers of hits on my blogs. The problem was that it was difficult to find a complete and up to date version of the play. I have made several revisions to it over the years and it had never been available in a complete updated and polished format. Today, that has changed as the play has a new name as well as having a new cover, professional formatting and a new title. My newly published book has undergone numerous revisions over the years and had been given several different titles such as Roswell1947, a Play and Roswell Revisited. Today, the complete and updated official authorized version of the play is available for purchase in the Kindle format on Amazon. Its new title is The Wild and Hilarious World of the Roswell Gang (Volume 1). This play was written in a serialized manner over a period of several years. I thoroughly enjoyed writing this play and often found myself laughing out loud while reading over what I had written. When it came time to get it ready for publication I had a lot of work to do. First, I had to find all the bits and pieces of the play. The next job was to organize, edit and revise The Wild and Hilarious World of the Roswell Gang (Volume 1). It was truly a labor of love. The real purpose of the play is simply to entertain people and give them a good laugh and hopefully, a temporary escape from the stress in their own lives. The Wild and Hilarious World of the Roswell Gang (Volume 1) will appeal to people who like to think out of the box and have the capacity and willingness to suspend disbelief. The book is a collage of many different genres such as comedy, science fiction, historical fiction and fantasy and is even a bit scary in places. Some words that I would use to describe it are bizarre and surreal. The events in the play are very loosely based on the legend of what happened during the summer of July, 1947 in and around Roswell, New Mexico. « Jack Shares His Betrayal With Mike.